Standing in the middle of the frozen wasteland of the Gulf of Bothnia, I felt like I could have been a thousand miles to the north. 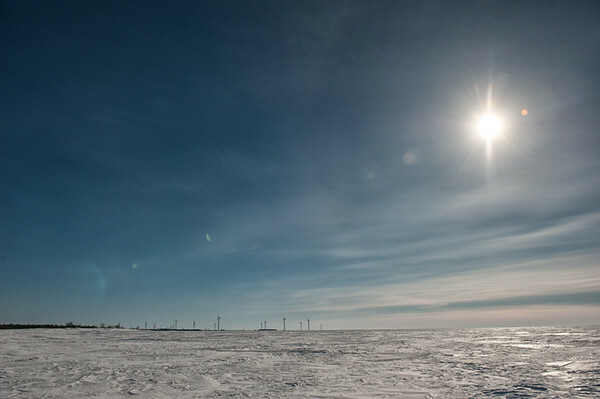 Sure, in the distance I could see a small windfarm, slowly spinning away in the light Lappish breeze, but when I turned away from it I was greeted with a sweeping vista of blue sky, sun, and ice as far as I could see. Nowhere else in Lapland had I felt more like I was in the barren wasteland of the Arctic…and I wasn’t even in the Arctic Circle anymore. The view from way out on the frozen Gulf of Bothnia. While I could have easily walked out onto the Gulf from the “Fantasia” themed SnowCastle — in fact, I had been told that it was one of the best places to watch the northern lights in Kemi — there was no way I could have walked out the kilometers out to where I was now. Instead, I’d plowed onto the ice on the back of a snowmobile going 50km/h. The last time I’d been on a snowmobile, I’d had a great time but found the whole experience of trying to keep the vehicle upright (instead of rolling down the side of a mountain) to be a bit exhausting. Plus, the trip had ended in sadness when a couple on the tour ran into a tree and ended up being helicoptered to the hospital. This trip was very different. Not only did I have no residual worries from the last trip — after all, there aren’t many trees growing out in the ocean — but within a few minutes, Sami, a Kemi local and my always cheerful guide, and I were already going faster than I had in the Lyngen Alps. I’m fairly certain that not all of the tours head out to sea at full pelt like we did, but since I was the only person on the tour we didn’t have to worry about leaving anyone else behind. 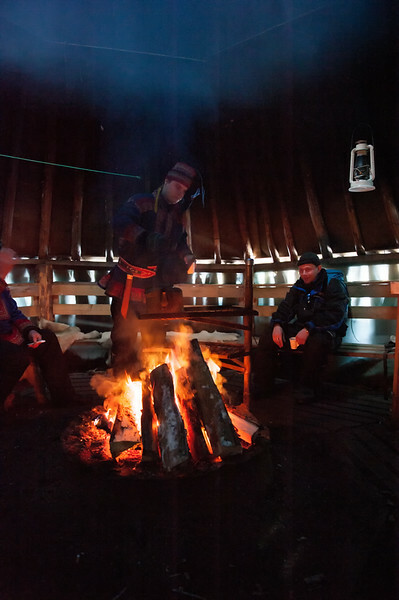 One of the kotas at the reindeer farm near Kemi. As fun as that was, it wasn’t enough to make up an entire seven-hour trip. So, after we got some of the need for speed out of our systems, we turned and headed towards a forested island. It was only a short distance from Kemi, but like everywhere in Lapland, it felt like we were miles away from civilisation once we got there. I had known that we were going to make a stop on the way, but I was surprised to find that the stop was at a reindeer farm. There were two herders there to greet us — a young man named Jani Lammi and his grandfather Reino Niemelä, who was beginning to go blind and needed help with the daily activities on the farm. Serving hot drinks inside the kota. Inside one of their kotas, Jani served hot tea and cold smoked reindeer on bread and told me about life as a herder on their particular farm. They only had four reindeer trained for driving; all of the others were for meat like the delicious smoked reindeer I’d just had. The difficulty in training those four reindeer to pull sleds shows in the price they would command; a reindeer sold for meat costs only €200, whereas a driving reindeer costs as much as €2,000-€3000! One thing that stuck in my mind was just how many people are moving south for university and never returning to continue the family business. It seemed that Jani was the exception, having returned home after going to university to study reindeer herding, rather than the rule. 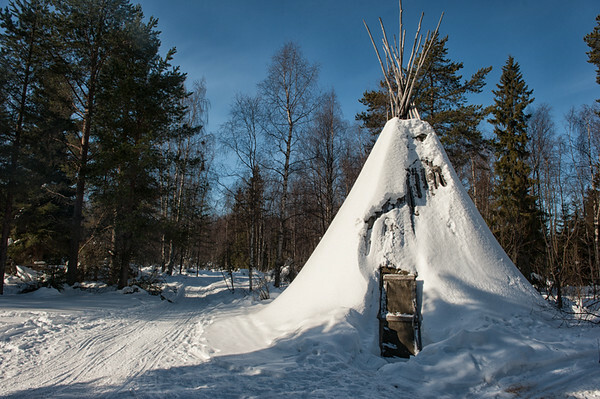 These dwindling numbers of Sami reindeer herders (and the small population of Sami in Finland to begin with) are reflected in official Finnish policy; while in Norway and Sweden you have to be Sami to herd reindeer, anyone is allowed to do so in Finland. Taken after I gave up trying to convince the reindeer to go faster. 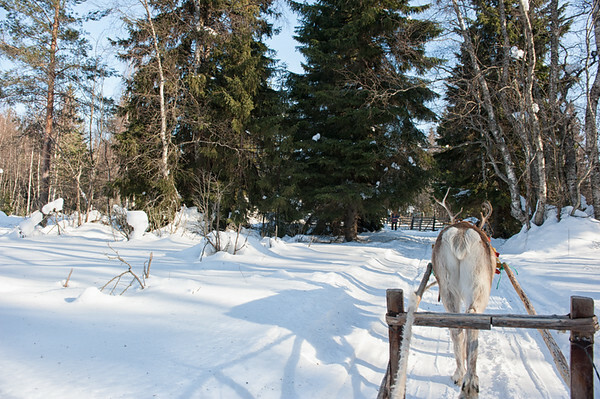 A visit to a reindeer farm isn’t complete without meeting some of the reindeer, so we went outside and Jani introduced me to a reindeer who was ready to take me on a small path through the woods. I had a lot more control on this ride than I had in my sled in Rovaniemi, seeing as I wasn’t attached to any other sleds and I had a rein with which I could try to goad the reindeer into going faster. This meant I felt a little more deserving of the international reindeer driver’s license I was awarded at the end. The big question here is: since I have two driver’s licenses, each valid for 5 years, am I now allowed to combine them for a 10-year license? The younger herder posing with of his four driving reindeer. 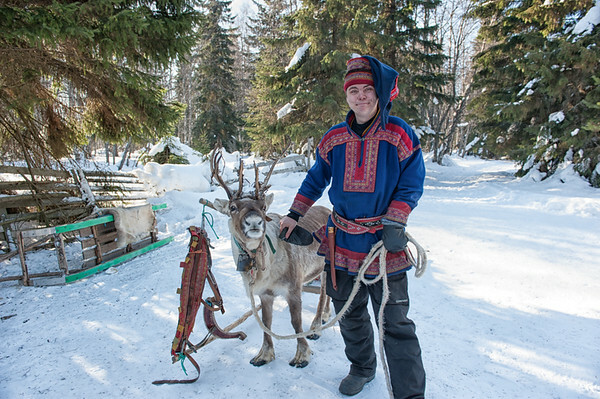 Tourist gimmicks aside, I enjoyed stopping at the reindeer farm; I only wish I had a bit more time to talk to the men there about their lives as reindeer herders. However, our snowmobile trip had a definite end time — the time we were due to meet the Sampo icebreaker ship at a point far out to sea — so we were soon slowly making our way through the trees back towards the frozen gulf. The rest of our trip is a complete blur. We bounced across the rough ice, which occasionally gave the impression that it had frozen mid-wave. Occasionally I launched my snowmobile into the air (completely by mistake) and then held on for dear life as it collided with solid ground again. There was no worry about cracking the ice; at this point in the season, it was over 50cm thick and would have taken an icebreaker ship, one that weighs in around 3,500 tons, to smash through it. 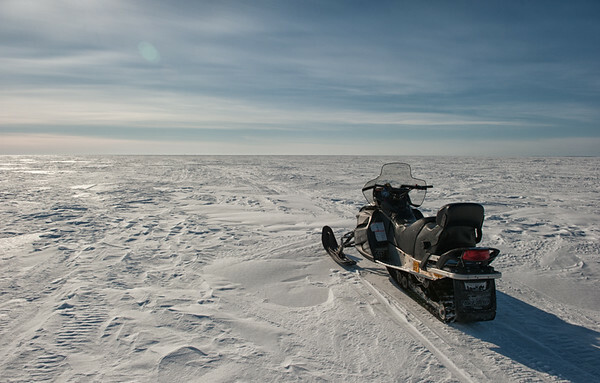 Sami’s snowmobile and the great icy expanse of the Gulf of Bothnia. Giddiness took over and I didn’t care that the terrain was unchanging. I loved it, and I struggled to see how the day could get any better…until we parked our snowmobiles on the ice and were raised onto the Sampo in a cherry-picker-like basket, feeling like rockstars as all of the other passengers looked on! Which would you rather do — snowmobiling in the mountains or on the frozen ocean? Or would you prefer reindeer sledding? I went snowmobiling on the Gulf of Bothnia courtesy of Kemi Tourism and Visit Finland, but all opinions stated here are my own. Snowmobile trips to the Sampo icebreaker are offered from Wednesday-Sunday by Lapponia Safaris and cost €425 (which includes the trip on the Sampo). If you go, tell Sami I said hi! This trip we had here was fantastic and Yes ,we loved it!!! So glad you enjoyed the trip too Mila! It was a fantastic day. Morgan and I are talking right now and realizing that, quite frankly, your life is way cooler than ours. Pun intended. PS: Morgan remonstrated with me for spelling realizing with something called a ‘zed’. Whatever that is.